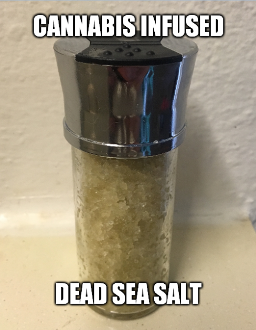 This is Dead Sea Salt that has been infused with Cannabis infused Coconut oil. It is Not available to ship across the US because it's still against the law and we could both get into trouble so don't buy this unless you live in Colorado and I can deliver in person. Notice I said Cannabis and not just CBD or THC. That is because those are only 2 out of at least 80 cannabaniods that are in cannabis. Rick Simpson used high Indica plants, whereas other love the CBD. I've combined at least 10 varieties including many strong Indicas, CBDs, and even Sativas. A range of cannabis plants so I'm sure also a good range of cannabaniods. I also used a few whole plants not just the flower as there are different componanets in the stems and roots as well. I've always used stems and seeds in making my coconut oil as that's my secret to making such a strong infusion oil. One brownie and that's it lol. Seriously though science is catching up with me and there's many article now stating that using the whole plant is much more beneficial than just CDB oil. When making Live Ormus Oil I simply take Organic Coconut Oil, throw in some cannabis, and I cook it in a pan on low. After a few hours I filter the oil and then added Dead Sea Salt. Then after letting it sit in a M.E.O.W. kettle for a few days and shaking it up many times sporadically I then filtered out the salt. So now I have a very strong healing Live Ormus Oil and also this salt thats infused with Cannabis Coconut oil. Two amazing products.